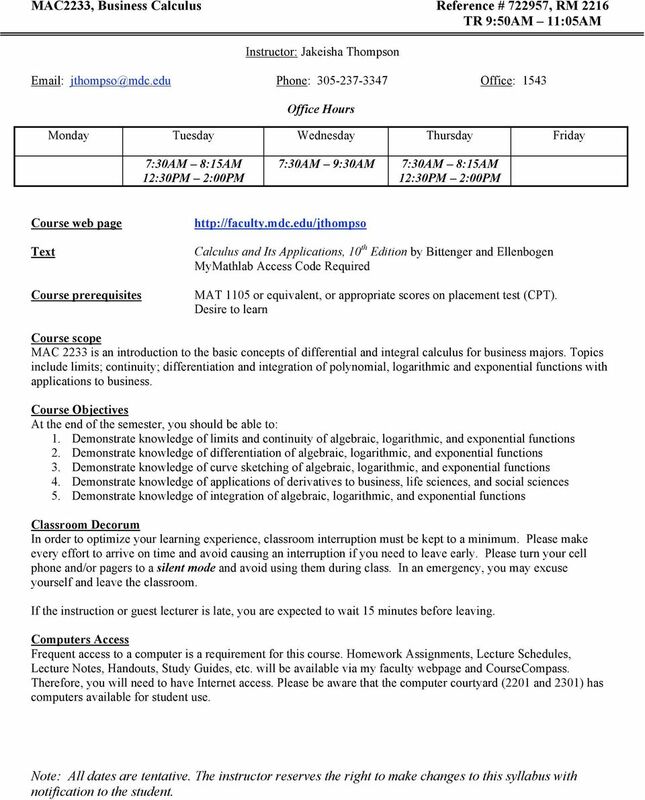 Download "MAC2233, Business Calculus Reference # 722957, RM 2216 TR 9:50AM 11:05AM"
1 Instructor: Jakeisha Thompson Phone: Office: 1543 Office Hours Monday Tuesday Wednesday Thursday Friday 7:30AM 8:15AM 12:30PM 2:00PM 7:30AM 9:30AM 7:30AM 8:15AM 12:30PM 2:00PM Course web page Text Course prerequisites Calculus and Its Applications, 10 th Edition by Bittenger and Ellenbogen MyMathlab Access Code Required MAT 1105 or equivalent, or appropriate scores on placement test (CPT). Desire to learn Course scope MAC 2233 is an introduction to the basic concepts of differential and integral calculus for business majors. Topics include limits; continuity; differentiation and integration of polynomial, logarithmic and exponential functions with applications to business. Course Objectives At the end of the semester, you should be able to: 1. Demonstrate knowledge of limits and continuity of algebraic, logarithmic, and exponential functions 2. Demonstrate knowledge of differentiation of algebraic, logarithmic, and exponential functions 3. Demonstrate knowledge of curve sketching of algebraic, logarithmic, and exponential functions 4. Demonstrate knowledge of applications of derivatives to business, life sciences, and social sciences 5. Demonstrate knowledge of integration of algebraic, logarithmic, and exponential functions Classroom Decorum In order to optimize your learning experience, classroom interruption must be kept to a minimum. Please make every effort to arrive on time and avoid causing an interruption if you need to leave early. Please turn your cell phone and/or pagers to a silent mode and avoid using them during class. In an emergency, you may excuse yourself and leave the classroom. If the instruction or guest lecturer is late, you are expected to wait 15 minutes before leaving. Computers Access Frequent access to a computer is a requirement for this course. Homework Assignments, Lecture Schedules, Lecture Notes, Handouts, Study Guides, etc. will be available via my faculty webpage and CourseCompass. Therefore, you will need to have Internet access. Please be aware that the computer courtyard (2201 and 2301) has computers available for student use. 2 is the primary form of communication used for this course. All students should have addresses registered with the college and should check frequently. 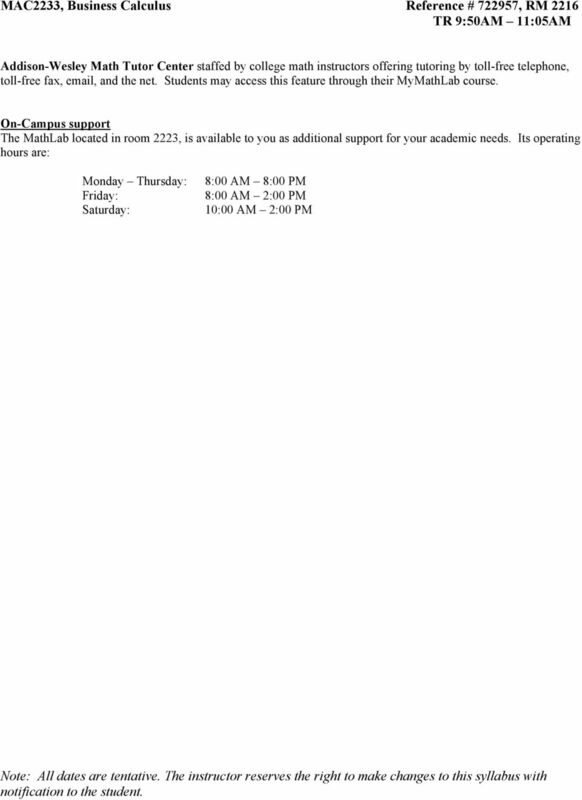 Any course announcements, changes, or updates will be sent to the address on file. 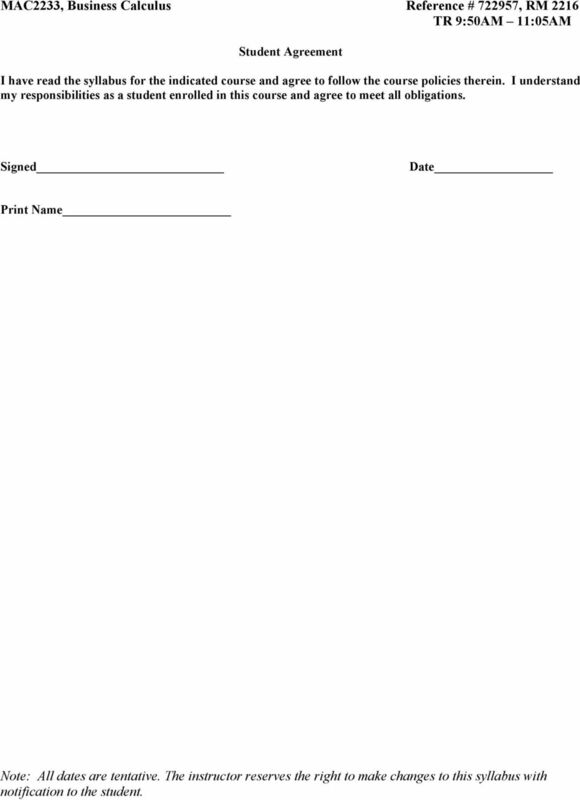 All s sent should include the following information: name, class, and the time that the class meets. Attendance Attendance will be taken for all classes. It is your responsibility to attend each lecture and keep records of assignments and other information delivered during class. The instructor reserves the right to drop any student who has excessive absences. It is your responsibility to ensure that you are enrolled in this course in order to receive a final grade. Academic dishonesty Any instance of academic dishonesty will result in a grade of F for the course and can carry an even more severe penalty such as suspension or expulsion. Take pride in your own achievements, an unearned passing grade is not worth the paper it is written on. 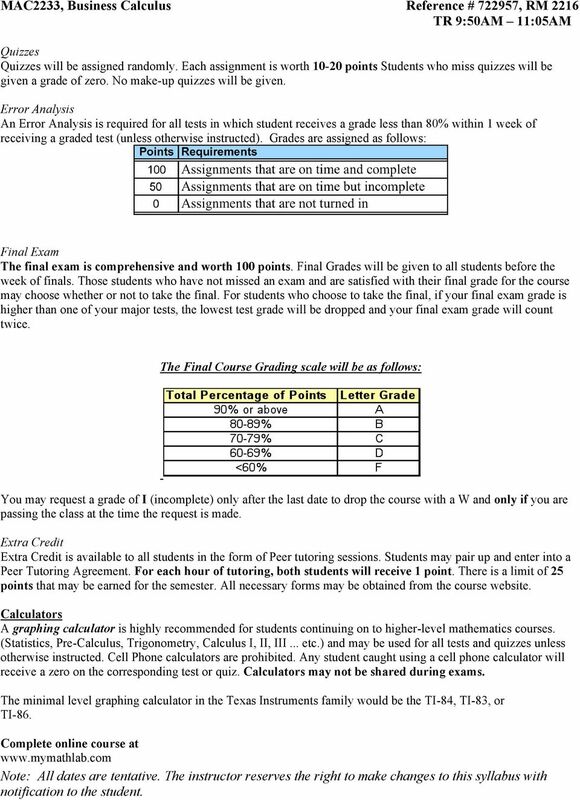 Grading Final grades will be determined based on retention of points in the following categories: Exams To avoid an automatic 10pt deduction on major exams, you must have completed all of assigned homework with a grade of 80% or better via MyMathlab software. All homework assignments are due by midnight on the day prior to a major exam. All tests are closed book, will consist of a total of 100 points each and will be taken in class. Make-ups will NOT be given. The final exam can be taken to replace ONE missed exam. 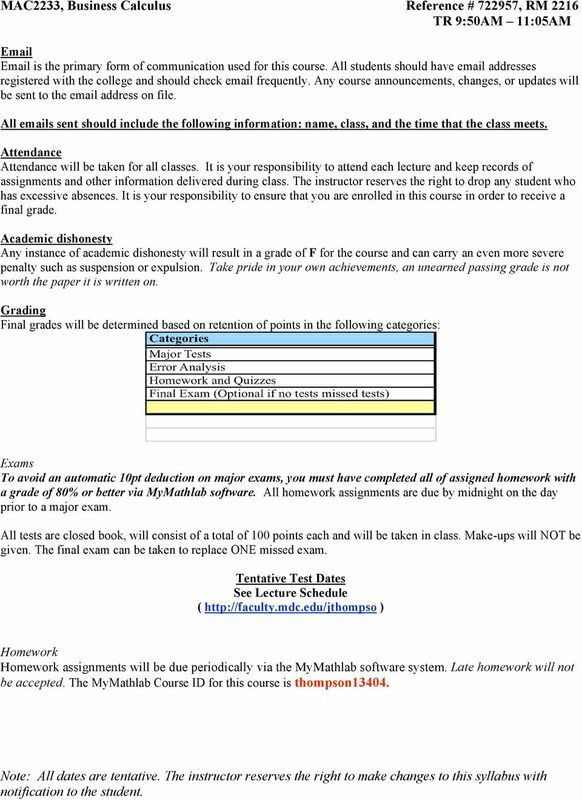 Tentative Test Dates See Lecture Schedule ( ) Homework Homework assignments will be due periodically via the MyMathlab software system. Late homework will not be accepted. The MyMathlab Course ID for this course is thompson13404.